The park, which is proving very popular and was the scene last summer of the annual International Dragon Boat Festival as well as the municipality’s new Art of Eating culinary event, would be upgraded in a variety of ways as a multi-use family-oriented site at the end of Manning Rd. 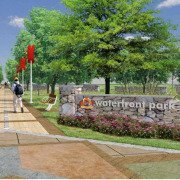 There would be walkways, benches, a beach, kayak and canoe access, more foliage including trees, a waterfront boardwalk, a multi-use area for festivals and events, and a “naturalized” area for native plant species. It’s the first major park bordering the water for the municipality, population 24,000. The town has a parkette adjacent to a pumping station. Tecumseh’s chief administrative officer Tony Haddad said the events last summer gave the town “an opportunity” to see how the park might be used and to “refine” future plans, which are in the concept stage. The park was such a hit with Dragon Boat organizers that they announced it would be their permanent home in summers to come. The event was moved to the park because the municipal CUPE strike in Windsor prevented the event from being staged. Haddad said the festival has pledged a granite dragon along with a memorial garden. Haddad said the revised plans will probably come before town council in November. Estimated cost for the park enhancements is $4 million. Haddad said the town doesn’t have the money right now and the park may have to be upgraded in stages, with fundraising and senior government infrastructure grants playing roles. Plans are proceeding for construction of a luxury senior citizen residence on three acres to the east. The overall 10 acre site was purchased by the town with three acres then sold to the Reichmann Acquisitions Group, which would build the residence. But there are “a couple of (planning) appeals that have to be addressed,” before the residence project can go ahead Haddad said. The 10 acres formerly consisted of the Lakewood clubhouse and two residences on the eastern side of the site. The property was acquired in 2006. An agreement with Reichmann allows the town to have additional waterfront frontage behind the seniors’ complex. Altogether there are 950 ft. of shoreline. As for whether the park will get a new name Haddad said it is “still early” in the planning stage for that to be decided.